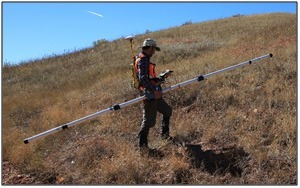 Purpose: Provide an environmental geophysics investigation to map subsurface water saturation adjacent to a water tank. Objective: Identify potential sources of water seepage and transit pathways. Method: A Frequency-Domain Electromagnetic (FDEM) survey was performed to achieve the project objective. 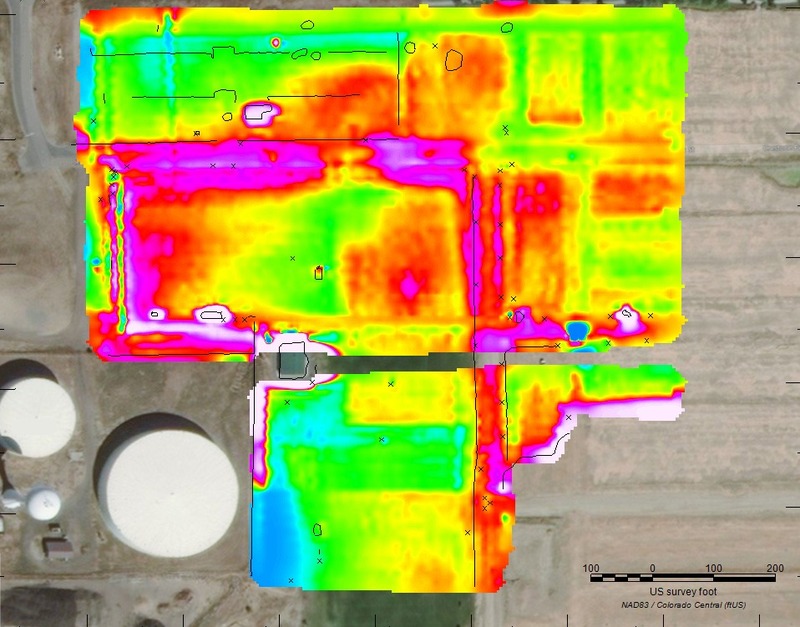 The FDEM data were acquired using an electromagnetic terrain conductivity meter. Data Acquisition: One of Olson's geophysicists used a Frequency-Domain Electromagnetic terrain conductivity meter over the course of two days. The objective area consisted of approximately 16 acres. Data were collected over the site in the East-West direction, at a nominal spacing of 10 feet. Electromagnetic data were recorded at a rate of 5 Hz, using a primary field of 9.8 kHz, at an antenna spacing of 12 feet. The system had Global Positioning System (GPS) measurements embedded into the data stream at a rate of 1 Hz to allow for precise data positioning. Interpretation: Raw FDEM and GPS data were positioned and converted to tabular data files. All further data processing and gridding of the FDEM data was performed using processing and data visualization software. The GPS-registered quadrature and in-phase component responses were gridded using the minimum curvature method. The grids were then exported as plan view map images showing both components of the electromagnetic response. The in-phase component is most sensitive to magnetic susceptibility, generally due to the presence of metallic features in the subsurface, either ferrous or non-ferrous, whereas the quadrature component is most sensitive to electrical conductivity, generally due to changes in lithology, moisture and/or fines (clay content). Result: The quadrature component results were presented as bulk conductivity (mS/m) and were displayed as a plan-view grid map, with ‘cool’ colors (e.g., blue) representing electrically resistive materials associated with normal ground moisture conditions and ‘warm’ colors (e.g., red) representing electrically conductive materials associated with high moisture content.